Not much sailing on our boat. 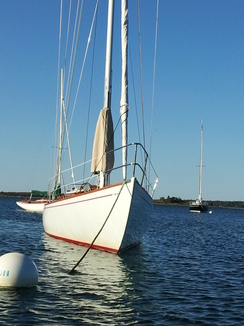 Norm got in many hours aboard Boston Sailing Center training boats. 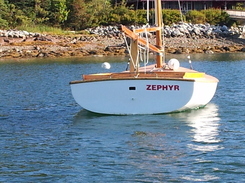 Elizabeth got out of the house a half dozen times to sail. Some years are like that. A reminder of the fun we had in 2007, the first year we had Averisera. Anchored at Indian Island in Muscungous Bay. that year, we sailed her over 1500 nm. It can be done! 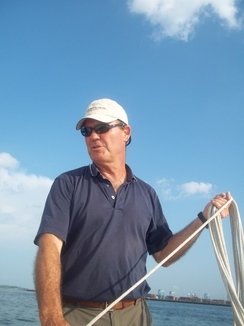 Norm photographed by a student at Boston Sailing Center. We were motoring back to the Center in a calm, coiling down and telling stories. 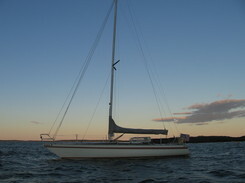 This is a superb image of the skinny boat we own. 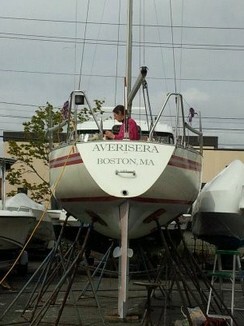 Elizabeth is in the cockpit, working on some last minute details before we launched from Admiral's Hill Marina, 2012. 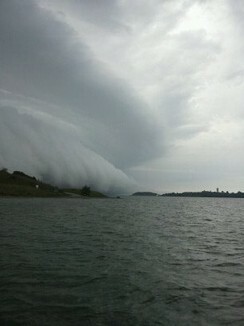 Storm clouds near Spectacle Island. The Summer had some of the best and worst weather. Norm was teaching, saw the squall developing and ducked in behind the Island for shelter. It was over quickly and dramatically. Swan maxi on her way out of the harbor. 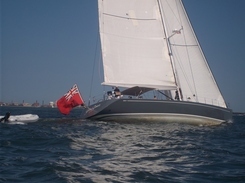 Boston is seeing more visits from large power and sailing yachts. 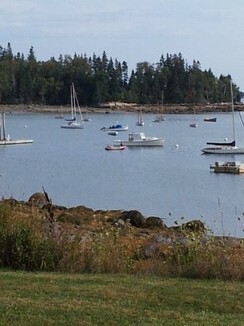 It seems that the city is the departure point for a number of the Downeast cruises. 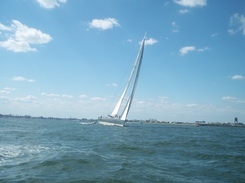 Newport is home base for the yachts in terms of repair and waiting. Some days, Newport looks like Antigua or St Martin, North. 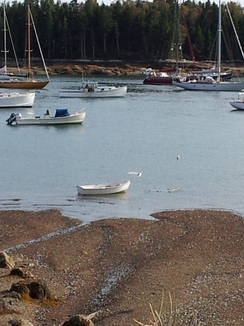 Boston sees yachts arrive, stay a few days, and then depart. Swan maxi on her way out. The camera barely had time to refresh between the time the first image was recorder and this one. One quick boat! Welcome to our new crew member, Otto Pilotte. 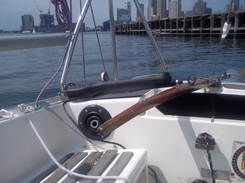 Working on the autopilot got Norm thinking about refreshing the old teak seat battens. Ugly "before" picture of the seat battens. 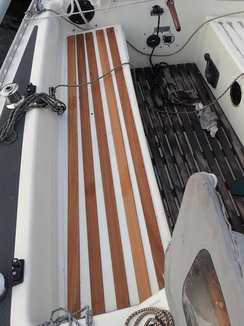 Norm removed the original battens, cleaned up the surface and glued new battens in place. New battens installed. 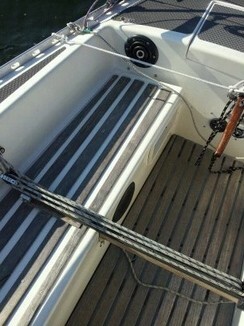 The wood came from Jamestown Marine as pre-cut and finished battens. they are similar to but not the same as the ones which were removed. Next task: clean the cockpit floor boards. Once done, the boat looked very proper. 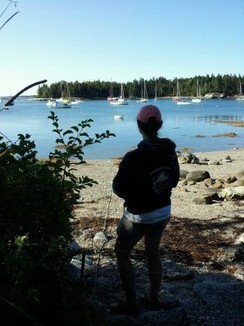 Following are images from our week away in Center Harbor/Brooklin, ME. One of the prettiest places we have ever been. The folks we met could not have been more welcoming. The rowing dinghy Elizabeth and Norm enjoyed once or twice a day. Touring the harbor by row boat, we met some sailing folk, watched birds, and got to walk the shoreline of the small island. Norm yacht-watches. Elizabeth bird-watches. Life is perfect. Mama at work bird watching. Other pleasures of the trip were building a dinghy haul-out, hiking Blue Hill, and living quietly.